2 Islamic architecture tried to inspire the same refreshing feeling of finding an oasis in the desert. This style of architecture flourished during the Dark Ages, especially in Andaluz, Spain. Islamic architects built structures surrounded by gardens. These buildings even had running water long before any European households had plumbing. Water was such an important element in their life that Islamic architects used it when they designed their mosques and palaces. 3 The first major Islamic building was called Dome of the Rock, which was the place where Muslims believe that their Prophet Muhammad ascended into heaven. Dome of the Rock was a mosque built in Jerusalem from 688 A.D. to 692 A.D. It was built as a shrine for pilgrims. 4 This building had many typical features of Islamic architecture. It had an onion dome. Its walls were elaborately decorated. Long ago, the walls of Dome of Rock were covered in dazzling marble and mosaics. In the 16th century, architects redecorated it with geometric marble tiles. 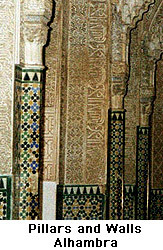 In Islam, pictures of people were not allowed, so the building is covered with geometric patterns and calligraphy. Muslims believe that God revealed himself in the book called the Koran. Words are sacred, so for a Muslim, calligraphy is also sacred.